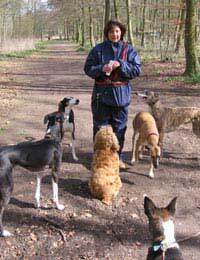 Now in her forth year as a professional dog walker, Sylvia is a person who is always keen to start work! The decision to set up her own business as a dog walker was made after Sylvia had twice been made redundant. Having helped out a friend-who already had an established dog walking service-Sylvia realized that this was what she wanted to do. Although there are no formal qualifications needed to set up in business as a dog walker, it is important that the person, or persons, handling clients’ dogs have an understanding of canine body language. A love of dogs and walking is also essential! Professional dog-walkers must have public liability insurance. Some companies specialize in this type of insurance policy and it is a legal requirement in the UK: understandably so as not all dog-owners are completely honest about their pets’ behaviour! Accidents can and do happen in any career with animals; but that’s no reason to be complacent about safety! The care and control of dogs and the number of dogs walked at any on time are subject to rules and regulations of local councils and the insurance policies required. On average, Sylvia walks 12-16 dogs per day. She is ably helped by a friend, and fellow dog-lover, which means she is allowed to take up to 6 dogs at a time. Some pets may be walked on their own by arrangement with the owners. The dogs are collected from clients’ homes and transported in secure dog crates inside Sylvia’s ‘Paw Tours’ van; this method of transporting the dogs is essential for the safety and comfort of all ‘on board’. Knowledge of locally available safe areas for dog-walkers is an absolute must for the smooth running of this business. Daily walks are planned to suit not only the animals to be exercised, but also the weather! Further necessities include the provision of water and water containers, spare leads, collars, poo bags, walking boots, wet weather gear and first aid kits for both dogs and humans. Sylvia always has a mobile phone with her. On Sylvia’s first visit, simply to meet my dogs at home, she spent a while observing them and writing up their details: ages, breed, our regular walking habits, the dogs immunization records (including kennel cough) pet insurance, identity discs, and compiling records of the dogs’ general health and habits. She took the contact details of their veterinary surgeon in case of emergencies as well as my telephone numbers. With the nitty gritty done, I asked Sylvia about her experiences as a professional dog walker. Hello, such a great post, I walk dogs from individual households its just safer that way as I have that very few dogs are actually superb leash trained.